The combination of low spring temperatures and high rainfall is expected to delay the drilling of maize across the country this season. Wendy Short picks up some tips for making sure the crop eventually gets off to a good start. What does the delayed spring mean for maize planning? Patience is always key for drilling date decisions and the principle is particularly appropriate this year, according to John Burgess, of KWS. “The worst possible scenario is to drill too early,” he says. “Soil temperatures need to reach a minimum of 8degC and rising for three consecutive days, for the seed to germinate. For heavier soils, it is advisable to wait for temperatures to rise to 12degC, to encourage rapid emergence. Maize seed will deteriorate if it is left in cold soils, with a detrimental effect on plant populations and, therefore, harvest results. “Some growers believe early drilling means an early harvest, but the early-maturing varieties which are now available require fewer heat units to mature and will catch up later in the season. Once soils have dried out sufficiently, the maize will require a reasonably open and rough seedbed, which will trap oxygen and retain heat, he adds. 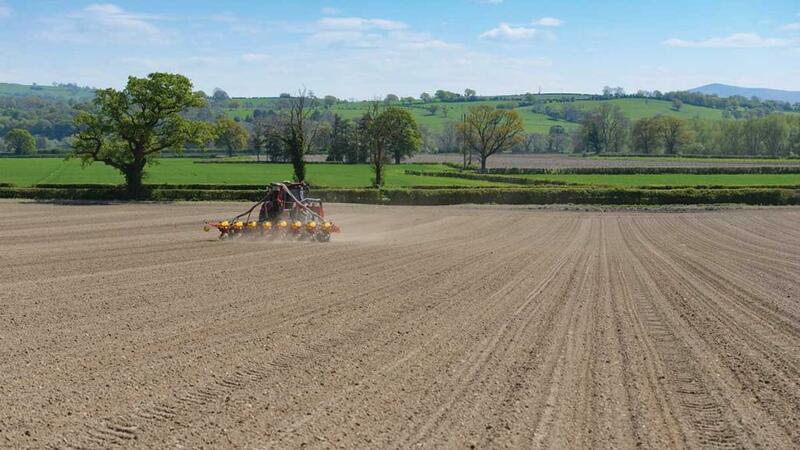 By contrast, a super-fine seedbed will reflect sunlight, as well as being prone to capping if heavy rainfall follows final operations. The advice to hold off drilling until conditions allow is echoed by Nigel Walley, of Agrovista, who suggests prilled lime may be the best option for ensuring soil pH reaches the required level of 6.5-7. He also recommends a micro-granular fertiliser. “A prilled lime product acts as a soil balancer during seedbed preparation as an alternative to ground limestone, but it can also be used post-drilling, in situations where land travel has been difficult,” he says. “Phosphate is essential for achieving high yields and good quality, but care must be taken when it is applied in less-than-ideal conditions, because of the potential risk of leaching. The past few seasons have seen relatively favourable weather at harvest, which has led to a slight shift away from early varieties, says Mr Walley. However, the poor start to the year means growers are facing a compressed growing season for 2018 and he predicts an increase in the popularity of short-season hybrid maize varieties. Guy Peters, of Procam, adds that late springs often result in the omission of a herbicide application before planting, but warns this may be a mistake. “A pre-emergence herbicide will buy growers time, if conditions are wet post-drilling,” says Mr Peters. “For dairy farmers without their own kit and with crops on loamy soils, a pre-emergence spray will be a good investment. “A spell of warm weather post-drilling will cause weeds to flourish, but the land may not be fit for access. In addition, we are probably looking at a post-emergence herbicide time window which will coincide with the need to harvest first-cut grass silage. “Maize is a crop which can withstand competition from its own kind, but young plants do not have the ability to out-compete weeds and may quickly become smothered; I have seen losses of up to 70 per cent in these situations. Mr Peters also advises caution when selecting fields for maize planting. “I cover the Devon area and several Environment Agency notices have been issued to maize growers in relation to soil run-off and water pollution,” he warns. “Historically, many maize crops have been planted near watercourses, as they are often located in valleys, for example, which offer a degree of shelter. “But environmental concerns have been highlighted in recent years and I would strongly advise farmers to consider any risk factors from soil run-off before selecting maize sites. Nevertheless, that does not necessarily mean avoiding waterside locations, because decisions will depend on gradient and land type,” says Mr Peters.